Perhaps you too have become a little bored with using the same commercial clasps over and over in jewelry design. Toggle clasps are very popular and seem to grace almost every bracelet and necklace today. While Gold, silver and copper are great materials, sometimes the shiny metal distracts from the design or calls for a clasp that isn't too obvious at first glance. 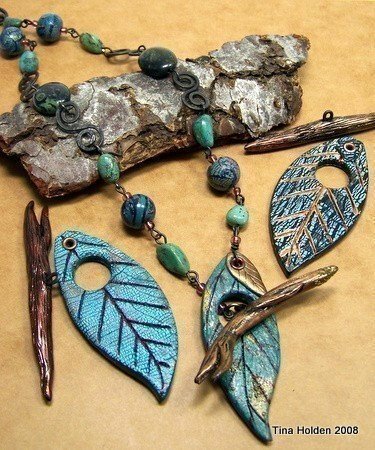 There are of course other not so obvious styles such as polymer clay covered barrel clasps, but this style of clasp serves double-duty as both clasp and pendant. 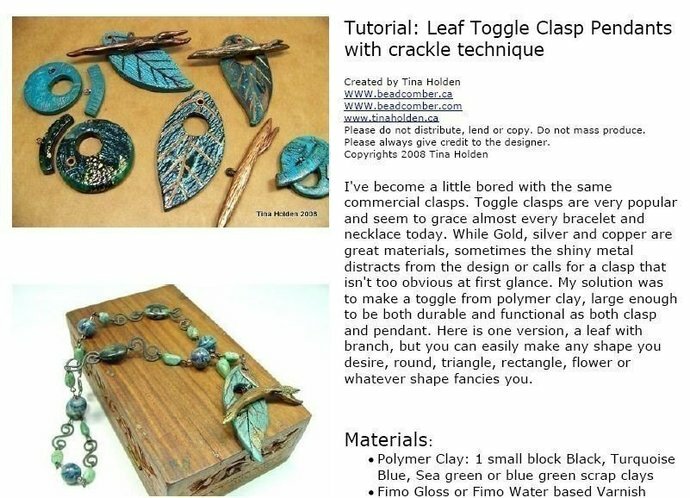 About my toggle clasp, it was first published in PolymerCAFE (April 2008). This newer version has now been reworked to include more detailed instruction, that I feel even a beginner should be able to achieve. 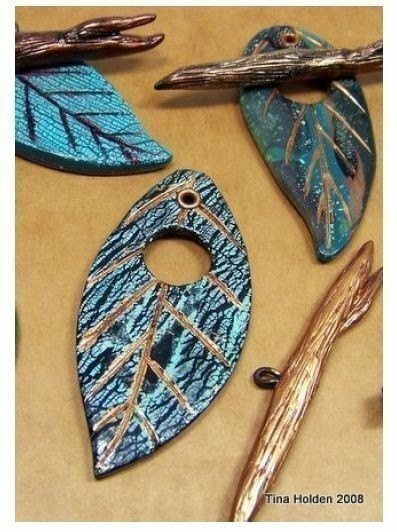 The tutorial includes a colored crackle technique that can be applied to many different projects. 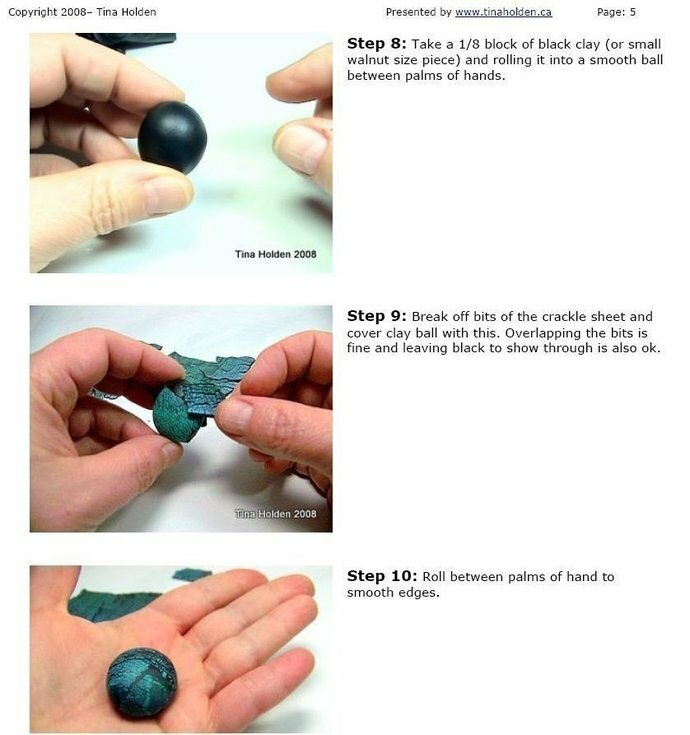 This tutorial consists of 37 photographs, 27 steps, 13 pages and a List of Tools and Materials. 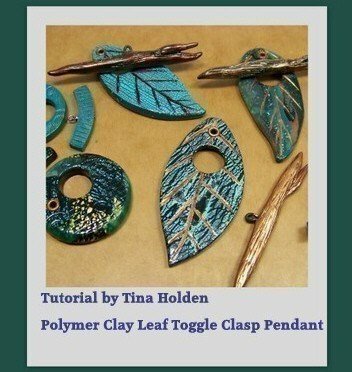 The precise instructions will guide you to create a leaf with branch toggle. Afterwards you'll easily be able to adapt the instructions to create any shape you desire, round, triangle, rectangle, flower or other shapes that inspire you. You may create and sell items you make from all my tutorials. I only ask that you please not share the techniques, so that I may continue to bring new and innovative ideas to you.